Fredrik Croona is a genuinely interesting creative talent. Already know for his work with Project Rotten and Menschdefekt, he has worked from the blueprints of those bands on his Cynical Existence project over the course of two full-length albums and a few EPs into a solid mass of dance-orientated electronics and uncompromising industrial metal. He has since delved further into solo experiments (as he has fleshed out Cynical Existence with permanent band members), and experimented with more melodic lines of enquiry. However, this latest EP doesn't share any of those more accessible leanings. 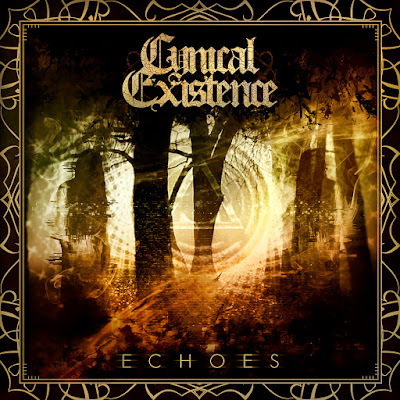 While still anchored to the aggrotech meets industrial metal sound he began to perfect on the last full-length album, the new EP 'Echoes' sees a slower, darker and definitely heavier turn in direction. 'Into Nothingness' is a nice opener with it's almost BlutEngel piano intro that is suddenly bludgeoned by the metal guitars and Croona's twisted vocals, but it does lack a little bit of urgency. The more up tempo 'No Regrets' on the other hand features a stronger dance place, addictive ebm electronics and some searing guitars that make this an immediately accessible track. 'Static' follows on nicely with another nice harsh ebm framework that combines with the dance beats and guitars to produce the stand-out track of the album. The instrumental 'Echoes' slows things down for a darker and more atmospheric take on the harsh ebm formula that works really well and even manages to keep its dance-friendly credentials. The EP is rounded off with 'The Endless Void' which has a far more well-rounded metal feel to it despite the abundance of electronics, it's energy though is less dancy and more of a sing-a-long live track which is a nice way to close the main track list. The EP includes two covers, one from System:FX and another from Venal Flesh. System:FX give the title track a really cool atmospheric rhythmic intro that descends into almost psychedelic electronics. Whereas Venal Flesh take the first track and create a much more dance-friendly cut that kind of feels as though it is the logical conclusion. The production is pretty solid throughout. It hasn't got the spit and polish of some of the bigger releases in the genre, and the guitars in a few places sound a little too low in the mix, but otherwise it displays a continued improvement from previous releases. 'Echoes' may not be a radical shift in direction, or even a major shake-up for Cynical existence, but it is a solid EP with some songs that will find their home on the dance floor as well as on the stage. Its a nice glimpse into where a possible future full-length could grow into and shows that Croona still has plenty of directions to take Cynical Existence.